Soak your vegetables. Don’t peel your potatoes. Crank up the oven when roasting vegetables. 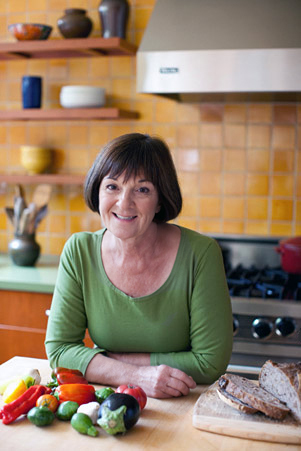 Those words of advice comes from our friend Marie Simmons, who “always looking for ways to cook the foods I love quickly without sacrificing taste and quality.” Marie, an award-winning cookbook author, is an authority on all things food. And, luckily, she’s written down her time-saving “solutions” to share with all of us. Give vegetables a good soaking: Freshly harvested vegetables cook more quickly because they contain more moisture. That moisture turns to steam in a hot pot, cooking the vegetables from the inside out. But we don’t always have access to freshly harvested vegetables. The solution: While you prep your other ingredients, put the vegetable in a large bowl of ice water for 10-20 minutes. This method works best with carrots, cauliflower, broccoli, greens, bell peppers and celery. Don’t peel: “Potato skins add flavor, as do beet skins, squash skins and carrot peels,” Marie writes. Just wash them well and, if necessary, scrub them with a brush to remove any dirt. Cut vegetables into smaller pieces: That will shorten their cooking time. Sliced and diced potatoes, for example, cook more quickly than large pieces. Grate garlic, don’t chop it: Two strokes of a garlic clove along a Microplane rasp grater deliver “soft, fine garlic every time.” It beats chopping or a garlic press. Cut onions into thin lengthwise strips: Marie calls this “the fastest, easiest way to cut them.” Halve the onion from stem to blossom end, and then peel. “Place it cut side down on the cutting board and cut lengthwise into thin slices,” Marie says. “They will separate into thin crescent-moon-shaped pieces.” We used this tip yesterday and it worked beautifully. Pan-searing gives fast, flavorful results: Heat a cast-iron skillet or other heavy, nonstick skillet until it’s hot enough to make a drop of water sizzle and evaporate. “Drizzle the pan with a little olive oil and then add the vegetable,” Marie says, noting she uses this method mainly for cherry tomatoes and mini bell peppers. It’s a quicker method of cooking. Plus, the vegetables blister and blacken while the juices caramelize. This technique, at a slightly lower temperature, also is good for thick slices of beets, carrots, and winter squash. Use high heat for roasting vegetables: It cuts about 20 minutes from most vegetable roasting times. Marie advises putting a heavy-gauge baking sheet in the oven and cranking the temperature to 450 degrees F. Oil and season your vegetables then place them on the pan, making sure not to crowd them. “When the food hits the pan, it immediately begins to sear,” Marie notes.